Fenugreek leaves is known as Methi Patta in Hindi and Vendhaya Keerai in tamil. It has many health benefits. Fenugreek leaves are a good source of iron, calcium and dietary fiber. As it is a rich source of dietary fiber, it helps prevent constipation. It is said that methi seeds helps in lowering blood sugar levels in diabetics. Soup prepared with fenugreek (methi) leaves is a good appetizer and is also good for lactating mothers. 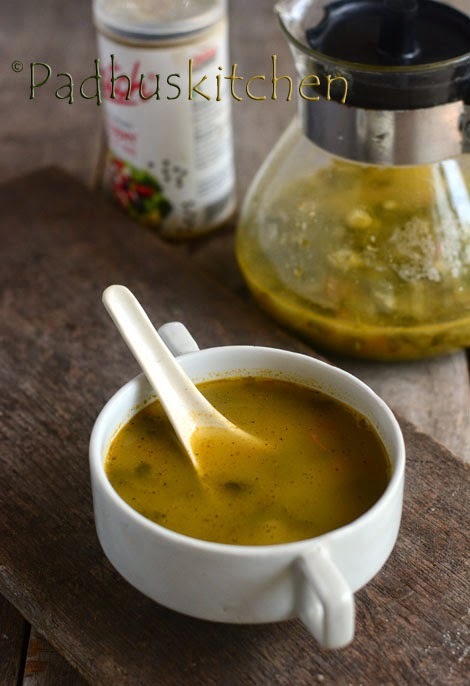 Today we will learn how to make vendhaya keerai soup following this easy recipe. Wash, clean and chop methi leaves. Chop onion, garlic and tomatoes (seeded) finely. Heat oil in a pan, add onion, garlic and saute until onions turn transparent. Add tomatoes and cook for a few more minutes. Add chopped methi leaves (vendhaya keerai) and saute until the greens wilt. Add 2 cups of diluted dal water, salt needed and simmer for 15 minutes. You can also pressure cook for 1 whistle. I blended half of the soup and then added to the rest and simmered for another 15 minutes. Add pepper powder to taste. Enjoy this delicious and healthy soup piping hot. I love this. In frigid weather like we are having now, where the temperatures are 14 C below zero, this will be most welcome. Thank you. Thanks for this awesome recipe. We loved it. I pureed the sauted onion tomato methi leaves and added to dal water for the sake of my kids. I tried and that was nice, but i added ghee, ginger garlic paste an fennel seeds for flavor and it was amazing.